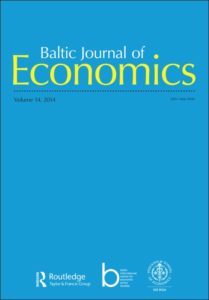 The Baltic Journal of Economics (BJE) is the journal of the Baltic Economic Association. It disseminates high-quality original and innovative papers within a broad range of economic disciplines. It publishes research of general interest, but especially welcomes articles relevant for the Baltic region. Authors are invited to submit theoretical and empirical papers including manuscripts focused on economic policy analysis. The Journal aims to stimulate dialogue between academics and policy makers. The BJE provides open-access to all accepted papers without fees. We highly value speed of publication and aim at a fast refereeing process. The Journal is published jointly by Stockholm School of Economics in Riga (SSE Riga) and the Baltic International Centre for Economic Policy Studies (BICEPS) in cooperation with Routledge. The publication of manuscripts is also supported by the Bank of Latvia, the Bank of Lithuania and the Bank of Estonia.